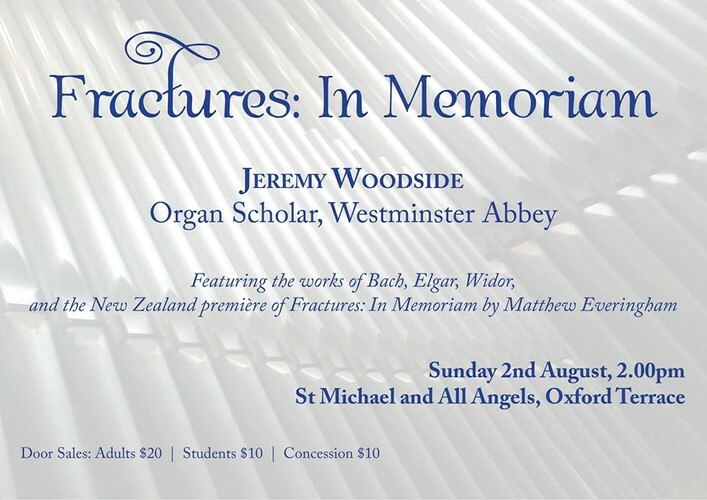 Cantabrian and Westminster Abbey Organ Scholar Jeremy Woodside returns to Christchurch to perform 'Fractures: In Memoriam', an earthquake memorial composition by Matthew Everingham that was premiered in Westminster Abbey, London in February this year. Matthew and Jeremy wish to invite all fellow Cantabrians to this concert to experience the piece with the people it was written for, and in the city it was inspired by. Jeremy's solo organ concert will also feature works by Bach, Elgar and Widor.... An exciting programme of powerful organ music that is not to be missed! Door entry is $20 adults and $10 students.